VNG international and the participating municipalities in LGCP use the 5 Capabilities (5C)-assessment to jointly identify capacity development needs. 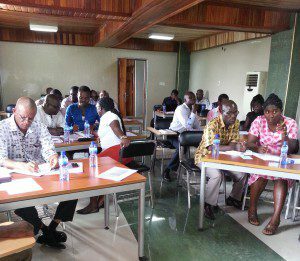 The training course in Ghana aimed at familiarising municipal sanitation officers with the 5C tool and exploring how it might benefit their work. Overall, the participants were very positive about the course. According to one of the participants: “The 5 capability-assessment is such a rich tool! I know have a better sense of what capabilities we need to strengthen in order to achieve our aim of becoming the cleanest city in Ghana”. Many participants expressed the hope that the tool would be taken up by their municipality as a way to assess their capacity needs, even after the end of the LGCP, and suggested to organise a short course for top management in their municipality to generate their support for this idea.